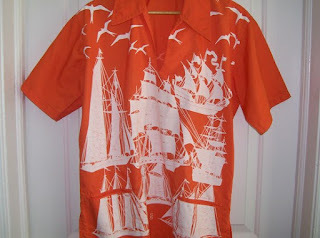 Vintage Mens Shirt Bagshaws of St.Lucia Tunic Island Style, bright orange with unique white sailboat and bird design silk screened by hand, 1960s or 1970s? The tag does not list the fabric, I believe it is cotton. This shirt has a v-neck, short sleeves and a pocket on each hip. Excellent condition! Please feel free to contact me with any questions or issues concerning my items. For international shipping quote, please contact me. What a smooth and correct article. The use of words is commendable.